A free newspaper in the East Midlands has undergone a radical rebrand to bring it into line with its sister daily. The Express series of free titles has been published from the same offices as the Derby Telegraph since the 1980s. Now it has been renamed Telegraph Lite and given a similar design to its daily stablemate. Telegraph editor Steve Hall explained that the idea was to take advantage of the strength of the Telegraph brand throughout the local area. Said Steve: “The Express has been in place for a number of years but as far as I was concerned its branding was nowhere near as strong as the Telegraph’s branding in the area. “We were very keen to make sure we leveraged the power of the Telegraph through it. Telegraph Lite will have a print run of around 70,000 and will be distributed free in outlying areas of Derby and surrounding towns and villages. The company claims it will give them a combined weekly readership of 220,000 when taken together with the Telegraph’s current daily sale of 30,715. The Express, then edited by Patrick O’Connor, became renowned during the 1980s and early 1990s as a training ground for young reporters. All Derby Telegraph trainees had to spend a three-month stint on the free paper with a brief to scoop their colleagues on the daily title. Where is Patrick O’Connor nowadays? Stan, I’d like to know where he is, too, as he was the first sports editor of the Nottingham Trader (once the largest provincial free newspaper in the UK) which I launched for the late, great Lionel Pickering 30 years this month. Earlier in our careers Patrick and I had a brush with mortality on the M1 outside Toddington service station in 1977 – when returning from an NUJ conference in Clacton, my road test Ford Fiesta hit a lorry in a 10-vehicle pile-up. We emerged unscathed, save that when we watched more carnage from the side of the motorway we discovered we were wearing each other’s glasses. Somehow in the crash our specs had flown off and I retrieved Patrick’s and he mine. All this happened before wearing seats belts was compulsory – and we weren’t. 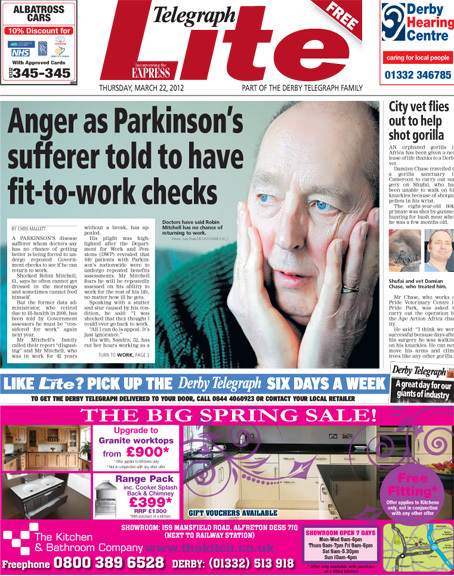 Patrick was a superb trainer of inexperienced journos – and the Derby Express a very good newspaper, free or otherwise.